I’m Elana Varon, a writer, editor and home cook. I started The Whole Kumquat because I believe it’s possible—despite having two middle-schoolers, a house with an overgrown yard, a business to run and a dream of having 7 hours of sleep nightly—to put healthy, fresh food on the table, then sit for a while to enjoy it. And I’ve decided to write about how I do it. I learned to cook, and to bake, from my mother and my grandmother. My grandmother was a professional baker, who ran her own bakery in Tel-Aviv for more than 30 years, catering parties and supplying other caterers with pastries, cakes and hors d’oeuvres. Maybe that’s why I’ve always tended to put my energy into dinner parties rather than into producing regular meals on a family-friendly schedule. But really, we ought to, most days at least, eat as well as the guests. I’m self-employed now, but I wasn’t always. My time is more flexible, but I’m just as busy. So this blog is a way to hold myself accountable—and to keep myself organized. I know I can do a better job at managing my kitchen, as well as the time I spend in it. Amid the chaos of deadlines, homework, meetings, laundry and soccer practice/play rehearsal/music lessons, meals sustain us. Not just physically. They should be considered. While I’ll eat just about anything, cooked any way, my tastes lean toward stews and roasts in the winter, grilled or raw food in the summer and lots of fruit and vegetables. I have a weakness for cheese, chocolate, citrus and chiles. As much as I can, I use seasonal produce (a challenge, sometimes, because I live in New England), whole grains and other minimally processed ingredients. If I can find a worthwhile—that is, inexpensive, easy or tastier&mdash;way to make something from scratch that I would otherwise buy ready-made, I’ll do that, too. 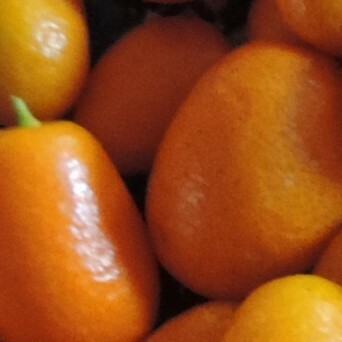 Fresh kumquats, by the way, are best eaten whole.